There is a lot to love about this little cake. Chocolate, cream & sugar…how can you go wrong. But there is another thing to love and that is what makes this cake true to its name; Le Gateau Magique! (aka Magic Cake). When baked, this simple batter of whipped egg whites, creamed egg yokes (with sugar), flour, butter and cocoa will give you a cake with three unique layers; a dense fudge base, a creamy custard centre and the softest sponge on top. Anyone who bakes cakes often would know, the perfect sponge is not always an easy thing to achieve. Beat too much air out of your egg whites while incorporating into your cake batter and you probably will end up with a flat sponge. But after baking a couple of different versions of the 'magic cake' recently, the sponge layer turned out light and fluffy every time. So how did I find a recipe for a magic cake? You'll find it in this little book 'Le Gateau Magique' (Christelle Hust-Gomez/Marabout). It caught my eye on a recent trip to Paris. I usually steer clear of buying heavy books on holidays, but as this was petit size and full of intriguing recipes and beautiful photography, I swiftly made my purchase. Even though it is written in French and I am not a French speaker, I have managed to learn the basics to get me by. This one was a brownie fudge version, without the custard centre…but no less delicious…bake one of these and you'll look like a rockstar with little effort! When you think of the city of Paris, for each of us a different image may emerge, maybe the touristy images of the Tour Eiffel or the upmarket shop-lined Champs-Élysées. But for me, the first thing I'll daydream about is the beautiful patisseries you find along Parisian streets. 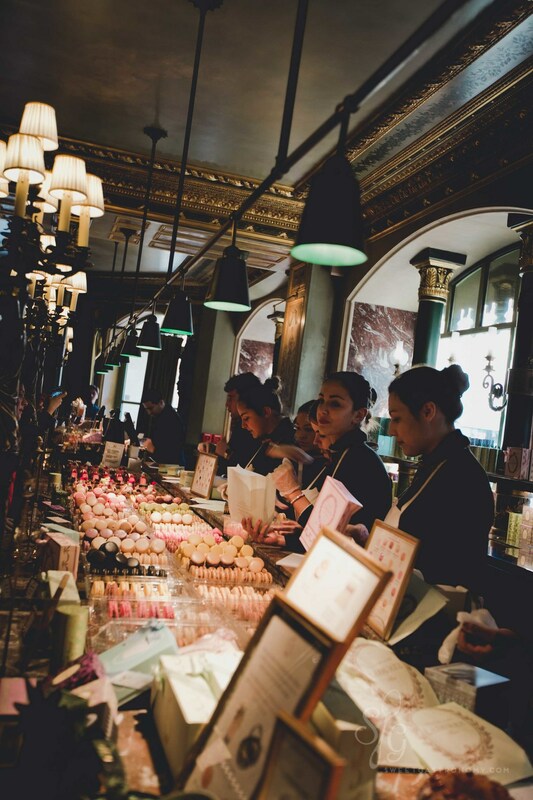 From the fancy and traditional Ladurée, to those baking a more modern take on the classics like La Pâtisserie Des Rêves and to where the locals shop everyday; they all have their place in the pastry scene of Paris. On my visit last December, I went from pastry shop to pastry shop, all in the name of 'research' and with the motto 'when in Paris' in mind, I devoured as many sweets as possible in this pastry paradise…come daydream along with me. 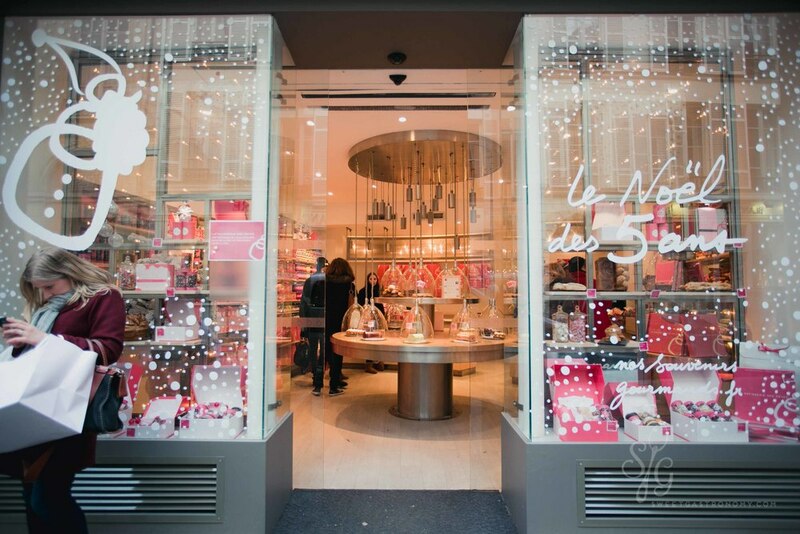 Hustling in the very busy Ladurée on Champs-Élysées to get our sweet treats. Sydney has been experiencing a burst of rainy weather of late. So I spent one exceptionally rainy weekend inside baking a lemon & lime tart. Being inspired by the restaurant Noma and their ability to create beautiful 'plate-scapes', I set about creating my own 'garden of eden' dessert for two. To make you will need a good sweet short pastry to make the tart shells. A buttery lemon curd for the filling and silky meringue thats perfectly whisked. I also gathered a few other finishing touches like gold leaf, micro herbs and edible flowers to decorate. When it came time to plate up, I decided not to restrict all the different elements to just being on the tart itself, rather I built a 'garden' around the tart, incorporating fresh passionfruit, puffs of meringue and a new found favourite; Pink Ice Finger Limes. These Aussie natives have flesh that resemble caviar, often referred to as 'lime caviar'. The little pink pearls 'pop' as you eat them, releasing a burst of slightly bitter lime juice, similar in taste to pink grapefruit. The lime caviar look amazing in food presentation, I am surprised I haven't seen it used more often, especially as it's native to Australia and everyone is keen on using produce from our own backyards. I hope your rainy weekends are as productive as mine was. It's been a little quite in my kitchen, as I recently headed south to Melbourne with a friend who I studied Patisserie with. We arrived to much cooler, rainier weather, but determined not to let anything dampen our plans and with my patisserie map in hand, we set off on our own sweet safari, ready to satisfy our cravings. As expected, Melbourne didn't disappoint. It seems every time I visit, another couple of patisseries and bakeries have open their doors. I'm not complaining though, my only complaint would be why can't more open in Sydney! So are your taste buds ready? Then cast your eyes over some of the snapshots I took on this little sojourn, starting at Chez Dre in South Melbourne, where the macarons look and taste delish and the coffee wasn't half bad either. A short tram ride away, we arrive in South Yarra. Hopping off just out the front of LuxBite where we find more perfectly formed macarons and a colourful array of modern morsels to try. After much thought, we decided on the Meringue Monster, as it boasts a centre of strawberry and watermelon mousse, a combination we couldn't resist. Ready for another sugar hit, we walked down to Chapel Street, where we perused the windows of A La Folie and Ganache Chocolate. We then headed for Burch and Purchese where we found just what we needed; more divine tasting creations this time from pastry chef Darren Purchese. We could have spent all day in there, tasting each and every dessert. Instead we purchased a raspberry dessert, a jar of salted caramel spread and a jar of half pineapple, half chocolate hazelnut spread and some Never Say Never Again biscuits. Yum! Back on the tram, we headed for Brunswick in the North where we stopped over at Savour to pick up as much chocolate as we could hold. Then back in Melbourne's CBD, we popped in to La Belle Miette for another round of macaron tasting after first sampling a sweet and savoury crêpe at Café Le Triskel. Our final stop was a little look at the beautiful windows of Hopetoun Tearooms, that are filled with an array of amazing cakes that we sadly ran out of time and didn't get to try, but it's first on the list for next time I'm in Melbourne along with Vue de Monde and Baker De Chirico. Melbourne truly is a mecca for dessert enthusiasts.